A Despacho is a sacred offering, often in the form of a prayer bundle. 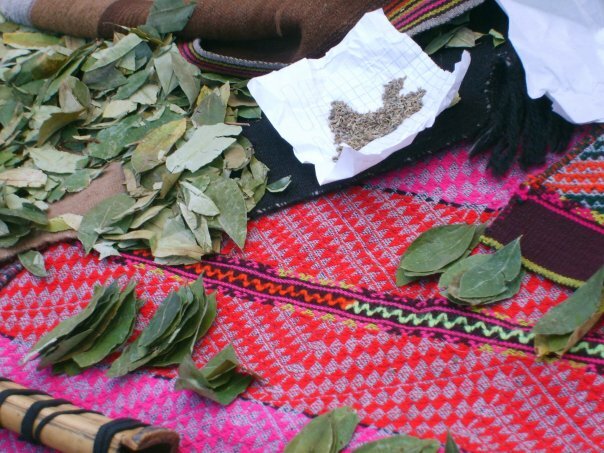 The Despacho tradition originated in the high Andes mountains with the wisdomkeepers of the Andean communities of Q’eros. The Andean people create Despachos to honor births and weddings, to ask for healing, and bless any new project or endeavor. Each element that is placed within the beautiful mandala of the Despacho is offered with prayers from those gathered for the ceremony. Every item holds symbolic meaning, calling for the release of certain energies, welcoming blessings and benevolent forces, and ultimately, prayers to return to balance and alignment with our own highest intentions, as well as with Pachamama. There are many kinds of Despacho, and a wide variety of offerings that can be placed in the mandala, including sweets, grains, flowers, incense, feathers, and leaves, but the most essential offering is an open, grateful heart. Once the mandala is complete, the Despacho is closed and bundled, and gifted to Spirit through ritual burning, burial, or offering to the water. Despachos are made as Ayni offerings. Ayni is a Quechua word that translates to Reciprocity. In the western world, we have lived for a long time as takers. The dominant religions and cultural traditions have led us to believe that the Earth is merely a collection of resources that are available for our taking, and the dis-ease, environmental destruction, species extinctions, and systems collapses that we are now witnessing are the undeniable result of thousands of years of living as takers. In the high Andes, however, the people have lived in an uninterrupted system of balance with the natural world for thousands of years. Ayni is the Law of Nature, insisting that we enter into sacred exchange, equal giving and receiving, and deep honoring of Pachamama as our true Mother, the sustainer of our lives. In the Andes, Ayni is not merely a concept, but a fully integrated way of life ~ as people have never assumed that they are separate from the rest of the natural world. From Genesis 1:28, “And God blessed them, and God said unto them, Be fruitful, and multiply, and replenish the earth, and subdue it: and have dominion over the fish of the sea, and over the fowl of the air, and over every living thing that moveth upon the earth.” For far, far too long, humans have taken this teaching too far, believing that the Earth is merely here for our purposes, for the harvesting of resources and for our dumping ground. Humans have gone deeper and deeper into the mental sickness that believes that we are not merely separate from the Earth, but we are superior to all other life and systems that are sharing this planet with us. It is the wisdom of ancestral traditions such as this one from the Andean master healers from Q’eros that may guide us back to a deep reverence and understanding of our place within the web of life. Ayni says that as we receive, we must give. And as we give, we must receive. Always in prayer, always in humility, and always in gratitude. Angela Blueskies first encountered the Despacho Ceremony tradition in the Cusco area of Peru in 2005, during her first journey to Peru. She was connected with a young Andean shaman by a colleague, and he was happy to teach her about the traditions of the indigenous people of the Andes. Angela and the young shaman spent two days together travelling to sacred sites near Cusco, and they were joined on second day by the shaman’s grandfather. Near a high hillside outside of Chinchero, the young shaman carried his Grandfather piggy-back style to the location where they would make their Despacho. Once everything was set up, Angela was told that she would be creating her own Despacho, and while usually there are certain members of the community that are responsible for making Despachos on behalf of others, and who were masters in the art and ritual, this time it would be done differently. The Grandfather told his grandson and Angela that at this time in the world, it is immensely important that people are making these offerings, and that is more important than making them in a particular way. Angela was told at that time that she was the first person outside of their lineage who had ever been allowed to make her own Despacho. At the time, Angela didn’t think much of this encoun ter, and happily joined in the creation of her own Despacho offering beside her young shaman friend. Now, having deepened her connection with this sacred tradition, she understands that she was given a wonderful gift that day ~ the gift of bringing the Despacho tradition into her own culture, and making it accessible to people in new ways that are both powerful and culturally relevant. Angela has made many, many Despachos on behalf of herself, her family, her community, and humanity during the years since that first Despacho, and it seems more important than ever that people living in the western world return to a deeper understanding of the cosmos and their place within it. In October 2016, Angela made the journey to one of the high villages within the Q’ero Nation for the first time. She joine d her mentors, Don Augustin and Dona Benita, for three days of connection with their community, with the land, and with their rich and profound traditions. They made a stunningly beautiful Despacho there, joined by their son Santos, and fellow healer Walter. Following the ceremony, Angela asked for their advice to bring back to her community and culture, which is in so much turmoil and chaos at this time. Their answer was always the same: Make more offerings. Once more, Angela was grateful to receive the guidance to continue bringing this powerful ceremony to her brothers and sisters, as humanity finds its way back to the Garden of Eden, back to wise responsibility, back to living in harmony, unity, and balance, and living with a profound reverence for all life as simply one part of the magnificent living systems of Pachamama. Angela and Helene offer Despacho Ceremonies at Rumi Wasi Sanctuary in Harpers Ferry, WV, as well as within their Washington DC community, The Tribe of Beltway Shamans, and beyond. They are also happy to make Despacho offerings on behalf of their brothers and sisters at a distance who cannot be with them in person, as well as by request for those who wish to arrange a private ceremony.